A quote from Jerry Barber, "A three foot putt in Los Angeles, is the same putt in Scotland, the same in Alaska, and the same in Russia. Players that over-practice three foot putts are NOT LEARNING a thing, but are actually hurting themselves". Growing up in southern California, I was lucky to play with, be around, and view many great golfers both amateur and professional. Jerry Barber was one of them. 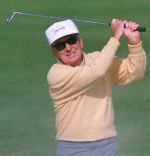 He played full time on the PGA Tour from 1948 to 1962 and played the Senior Tour up to his death at 78. Part of that time he also was head professional at Wilshire Country Club in Los Angeles. Later he and his son, Tom, were co-head professionals at the LA County run 36 hole Griffith Park Golf Course. I first watched, as a fourteen year old, Jerry Barber play in the finals of the Southern California PGA Championships at Recreation Park in Long Beach. In those days this match play event attracted players from the PGA Tour. The winner received a $2,000 check, which was pretty good in 1959. Tommy Bolt, Lloyd Mangrum, Tommy Jacobs, and Eric Monti were some of the names that I remember that played on my hometown municipal course. It was a big deal for Long Beach and the gallery for the 1959 final match between Jerry Barber and Mac Hunter probably numbered around 2 to 3 thousand people. Mac Hunter was a big favorite. He was forty yards longer off the tee, much straighter and better iron player then Mr. Barber. To this day I vividly remember Barber drop-kicking his tee shots so his clubhead could straighten and for him to find the fairway. Some of his drives only went 180 yards. In the 36 hole final, Mac Hunter out played Mr. Barber in every facet of the game, except for putting and score. Jerry won the match 2 and 1 with a fantastic display of up and down magic and outstanding putting. Eric Monti, a twenty year PGA Tour veteran, and forty-five year head professional at Hillcrest Country Club in Los Angeles, said of his good friend, that he got the most out of his golf game than anyone that he had ever seen. At 5'5" and maybe 150 lbs., he didn't have an ideal frame for a golfer. Dubbed "Mighty Mite", he worked to gain strength and was a health nut until his death in 1994. Never long off the tee and inconsistent with his second shots, he relied heavily on his short game. Barber practiced endlessly on what he felt mattered the most; the short game. Players would share rooms and travel together in the 50's and Eric and Jerry would travel together. One night Eric was awoken to this "thump – thump" sound every few seconds. He awakes to see Barber at 3 am pitching balls in the semi-dark into a chair. Obsessed? Yes, but sometimes that is what propels individuals to succeed where others fall short. Jerry was good friends with Sam Snead. They always played practice rounds together before the tournaments. But Sam wouldn't just play a round unless there was money on the line. So Jerry would play money matches with Sam. Sam was the far superior player and would win almost every time. Eric asked Jerry why he was just donating $50 to $100 to Sam every time they played. Jerry's reasoning was that Sam was the best and he wanted to be the best, so he had to play with the best and learn how to beat the best. The money that Sam won, Jerry looked at it as a learning experience and like paying for a playing lesson. Jerry's advice – Play with better players. Play with a group that will challenge you. Test yourself in competition against the best. In an Apprentice Seminar conducted by the Southern California PGA in the early 70's, I had the privilege to hear Jerry Barber speak for over an hour. The quote that is at the top of this article comes from that seminar. In almost every putting lesson that I teach, I retell of Jerry Barber winning the 1961 PGA Championship by holing a 20 footer, a 40 footer, and finally a 60 footer on the last three holes to tie Don January for the title. He then puts on another outstanding short game display in shooting 67 in the play-off to win by one shot. In the seminar, he preached that golfers spent too much time practicing short putts. He emphasized that you can make a poor stroke and still make a three foot putt. Put the same poor stroke on the 30 foot putt and you might miss by three feet. He felt that you improved your short putting (inside 10 feet) by excelling at putts over 30 feet. I have my students pick two holes that are from 30 to 40 feet apart. With two balls, I will have them putt back and forth to these holes for ten minutes. Usually within five minutes they have figured out the break and speed and then are fine-tuning the stroke and image to hole the putt. As they come closer to perfecting the stroke and mental and kinesthetic feel, they can immediately tell as the ball leaves the putter head if that putt is online, the right distance, and has a chance to go in. There is a lot more valuable feedback gained, stroke refined, visual discerned then in the holing of a three foot putt. My players, who have used this practice routine, make a lot more longer putts and three putt less than their competitors. Jerry's advice – Practice long putts over 30 feet about 2/3 to 3/4 of the time. Do not spend much time on 3 foot putts. They are not a winning combination. Jerry Barber was a remarkable man and he accomplished much more then I related in this article. I was floored after many years when I spoke with him on the phone, maybe two years before his death, that he remembered me and we shared about fifteen minutes of memories. He was still kicking himself for not winning the US Open at Cherry Hills in 1960 recalling he had the lead with six to play and how he felt he gave it away. Shows the competitor was still there at 76 years old. Hope you take his advice, because it comes from one of the all-time best putters of all time. Learn from the best!!! !